The food allocation "cesta ticket" went up to 180 from 4, the 4 if memory serves me well. Would it make any difference? At any rate that one will not be subsidized and the brunt will go straight to business owners just as the first signs of major contraction are already visible. Just check out how many stores have closed at your local mall over the last two weeks. But to make it all worse, the government is UNABLE to have a precise communication message. For example retirees rioted downtown Caracas Saturday because the regime had said they would be able to start withdrawing their new checks in cash starting that day. Of course, the banks were not given the order to open, nor they would have had enough cash for that matter. Some mumbling happened Sunday from the regime until finally tonight Maduro said that withdrawals would be 90 a day and that he was informed that the sale of cash is going on. For you people outside of this terror country cash scarcity has created a booming industry of cash sale. It works roughly that way. You go to a street vendor or some low life store that has a debit card point. You give your cash and the vendor will swap by his own debit card for twice the amount of cash you gave her in advance for your purchases. Later on he will resell it for an extra 50%. In short at the end of the day 1 bolivar went up to 3 bolivares for all practical purposes. It worked particularly well for retirees on miserable incomes, as the only way to survive. That is why they were all in throngs in the streets Saturday. That and they knew that prices are going to soar and they are in a rush to buy. Today the Central Bank had to remove a tweet it put earlier that meant basically that credit was dead in Venezuela. Now corrections have appeared. A few days ago the regime had forced the productive sector to "agree" on prices. Already this week they had to review many of them with a substantial price hike in some cases. I suppose that they finally listened to producers that were ready to stop production, turning in their keys to workers if necessary. Good luck selling below your production costs! 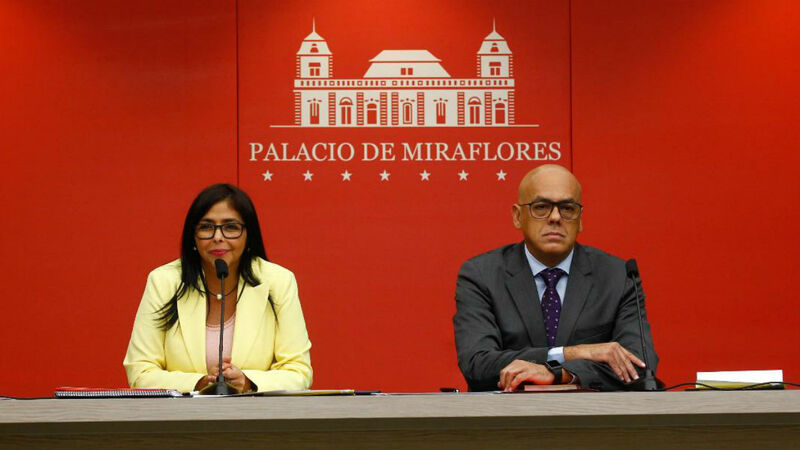 But the best was to see today a "press" event with the brothers Rodriguez, sociopath Delcy as the vice president and psychopath Jorge as the communication minister. You would have though that the press was summoned to clarify economic measures. Not at all, the time was spent on denying that there is a refugee crisis out of Venezuela. A crisis even reaching NPR. Then again you must know that at the same time a group of 13 regional countries that receive immigrants started today a meeting on how to deal with the crisis, a crisis that seems now risking changing the whole hemisphere as no other crisis has done in decades. Meanwhile the opposition is still settling accounts rather than dealing with the current situation. It is a crazy house my friends. The end is near. The end of something is, anyway. PS: Venezuela is so much on the front burner that all but one links are in English today! For a while now I do not understand why the regime keeps up the charade? They are in complete control and cannot look stupider or worse to the international community. So just implement the end game, let the mass exodus go and get to the Cuba style control. At least what populous is left can then get minimal food, medicine and security. The people won't rebel as they have shown they have no fight in them anyways, banging pots and pans is all they ever had. So with the international community essentially in acceptance and the people numb to it all just change the name to Cuba, call it a take over and get on with a similar way of life. Minha solidariedade a vocês, co-irmãos venezuelanos! My solidarity with you, fellow venezuelans. You try banging a pot or pan in front of armed hostile men Ash....if you think it takes no bravery. 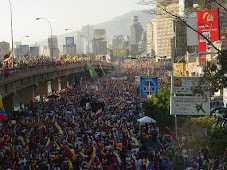 The brave resilient people of Venezuela can make their own decisions, and as they have chosen, to date, to maintain a peaceful protest, maybe it's because they know more than you, or I, as to the way to proceed and the cost of various alternative strategies. We all hope for a change for the better for Venezuelans, including no doubt the present regime; how to achieve that is entirely another matter. Those of us not facing men with guns should not suggest we understand.